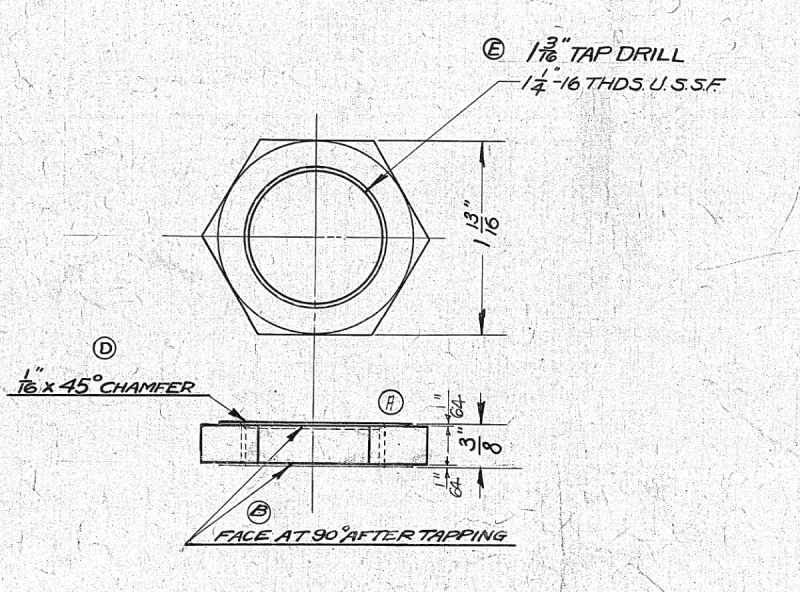 Anyone have any ideas on where I might be able to buy a thin hex jam nut - thread size 1¼" x 16 threads per inch. The "normal" fine thread nut this size is 12 threads per inch - as you can see below this is labelled as USSF - presumably US Super Fine? I don't think a tap with that thread is made now. Thanks Mike - yes, I found that one at McMaster Carr. And a couple of other places too. This is the one I'd like to replace - it has been severely abused in a former life by someone too lazy to find or buy a socket (1⅞") to fit it. 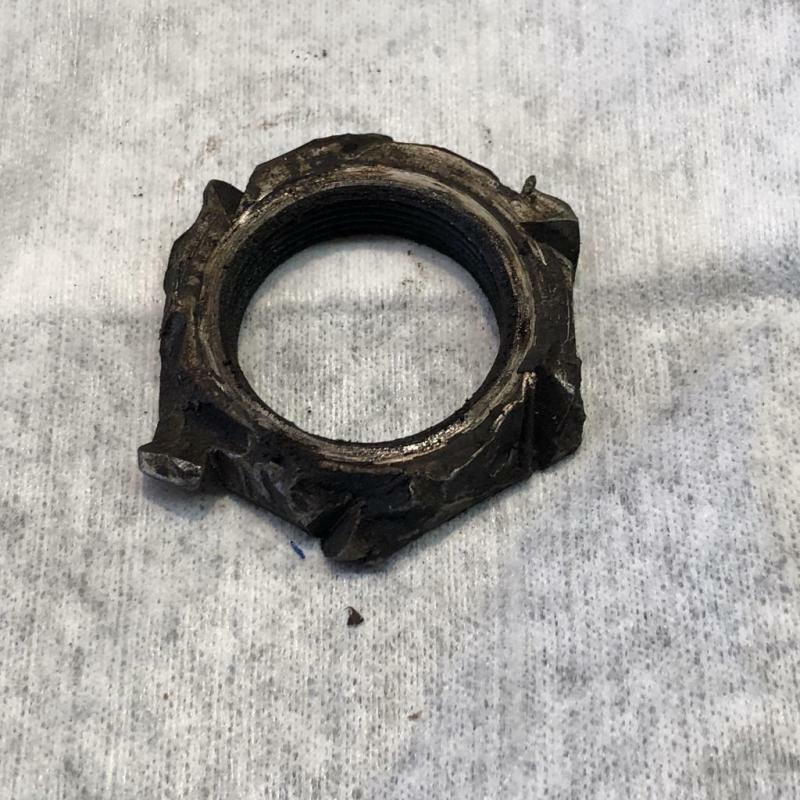 Neither the "snout" or the nut were very tight - the snout came off with almost no effort and the nut with very little effort with a 2" socket on it. Had a similar issue, welded a larger hex ring around a damaged crank jaw damaged surface. filled in and smoothed surface. 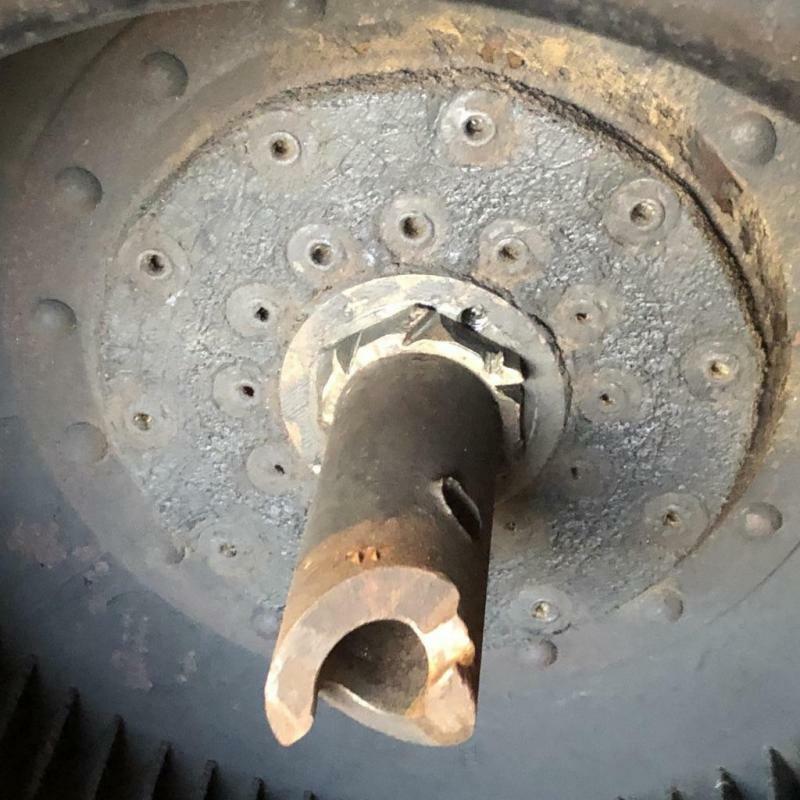 looks like you may have room around your damaged nut to add to the overall diameter. Perhaps you have thought of carefully, bit by bit welding up the surfaces and then redress the surfaces. If I don't find a better one, I just plan to reuse this one, pretty much as is - I don't want to do anything to it that might damage the threads in any way so it would no longer thread on. The long "snout" (the crank handle part) that goes on after this mangled nut has much more length of the threads to engage, and so can be tightened up pretty well after the nut has been tightened. I might try and file down the worst of the lumps on it to get it to better fit a 6 sided socket that I have. Have you asked Mike West? He has a huge supply of Franklin parts. The proper tap is readily available...look on ebay, the cheapest I saw was about $28.00. You will need a piece of hex stock the proper size - try speedy metals. Making a nut like this is about 2 hrs work. I'd offer to single point one for you but without the crankshaft to fit it to, I can't be certain of the fit. A tap is the right way to go. If you are willing to pay for the material, I'll make it for you and take the tap as my profit. I looked for taps and did not find any. Not 1.25-16. There were others, but not that. I'd like to see the link to the tap. I would buy one of those nuts at Mcmaster-Carr that are 1 1/4 - 12 and run this tap through to alter the threads. These two are both priced at $28.95 and by the same seller. But you better verify they are correct. This seems like the type of seller who can make mistakes in descriptions. A very poor idea if you want the threads to be secure... I doubt you could even torque it properly without what remained of the threads pulling out. Well test it out and measure the torque then. The fan is away having its rubber disks replaced, so I won't see it probably for a couple of weeks to put things back together. found on Ebay lookup 06-11800 or axle nut Cessna . found on Ebay lookup 06-11800 or axle ﻿nut ﻿Cessna﻿﻿ . made of aluminium, and much thinner than the original is.